Everything belongs to God. 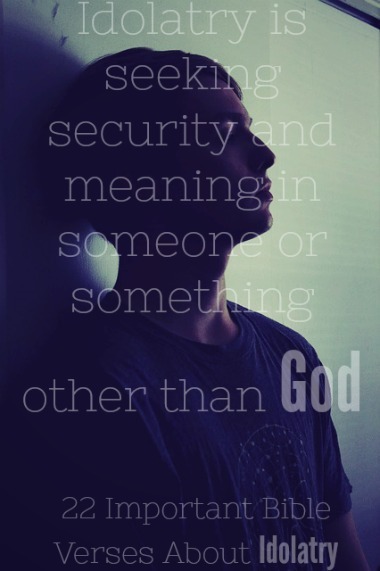 Everything is about God. We have to understand who God is. He is not a god He is the one and only God of the universe, who reveals Himself supremely in the person of Jesus Christ. Romans 1 tells us that idolatry is exchanging the truth of God for a lie. It’s worshiping the creation rather than the Creator. It’s exchanging the glory of God for self. Anything that takes the place of God in your life is idolatry. Christ reigns over all and until you realize that you will be running around searching for things that will never complete you. Idolatry begins when you lose sight of Christ. We have taken our focus off of Christ. We no longer have an impact on the world. People don’t know God, they don’t want to know God, and now idolatry is growing faster than ever before. “If you want to follow Jesus because He will give you a better life, that’s IDOLATRY. Follow Christ for the sake of Christ. He is WORTHY.” – Paul Washer. “For what is idolatry if not this: to worship the gifts in place of the Giver himself?” John Calvin. “We make a god out of whatever we find most joy in. So, find your joy in God and be done with all idolatry.” John Piper. God is going to break your idols. When you have been saved by the blood of Christ, then comes the sanctification process. God is going to break your idols. He is going to prune you. He is going to show us that idols in our life hold no merit and they will leave us broken. A few years ago, my brother had a kiteboarding accident. Due to his accident, he would have constant headaches. It would hurt his head when he read books. The only time reading wouldn’t hurt his head was when he was reading the Bible. Through his pain the Lord allowed him to see that his kiteboarding hobby became an idol in his life. It took the place of God in his life, but at the end of the day it didn’t satisfy. It left him empty. My brother’s relationship with Christ grew during this time and for the first time in a long time he had peace. He found satisfaction in Christ. Sports can be an idol for many. That is why many athletes push themselves to the limit and they try to outdo themselves. We can literally turn anything into an idol. We can turn our hobby into an idol. We can turn godly relationships into an idol. We can turn worry into an idol. God is going to reveal to us our idols and He is going to show you that apart from Him you have nothing. What is your eye looking at? Once again, some of the most innocent things can become idols. Ministry might be the biggest idol for believers. God looks at the heart. He sees what your eyes are looking at. Many of us want to be the big guy. Our eyes are set upon having the biggest church, being known as the most spiritual, knowing Scripture more than others, etc. We have to ask ourselves what are our motives? What is your motive for reading Scripture? What is your motive for wanting to plant a church? What is your motive for wanting to go on a mission’s trip? Jesus said, “whoever would be great among you must be your servant.” We don’t want that today! We would rather have the fame than to be a servant in the back. It might seem harsh, but it’s true. Are you doing all things for His glory? Sometimes we become so busy doing things for Christ that we forget the One who we do it for. Many preachers are lifeless in the pulpit because they have forgotten the Lord in prayer. Have you turned the things of God into an idol? What is the goal of your life? What are you looking at? My performance as a Christian used to be my idol. I would have full assurance of my salvation when I was feeding myself spiritually. However, when I forgot to read Scripture or was not feeding myself spiritually I would not have full assurance of my salvation. That’s idolatry. My joy was coming from my performance and not the finished work of Christ. Your performance as a Christian can become a huge idol and if it does become an idol you are going to walk around joyless. Instead of looking at your imperfections, your struggles, and your sin, look to Christ. Our shortcomings make His grace shine so much more . Nothing can compare to the water that Christ gives. Something that we can never deny is that nothing will ever truly satisfy us. You and I both know it! Every single time we try to find joy in other things we are left stranded in the desert. Apart from Jesus Christ there is no eternal joy. Our idols give us a temporary peace and happiness and then we go back to feeling dull again. When we choose our idols over Christ we go back feeling worse than before. Christ is everything or He is nothing. When you fall on hard times what is the first thing that you do to ease the pain? There is your idol. Many people eat, they watch their favorite shows, etc. They do something to try to numb the pain, but these are just broken cisterns that don’t hold water. You need Christ! I’ve tried to satisfy myself with the things of the world but they left me dead inside. They left me begging for Christ. They left me more broken than before. Nothing can compare to the joy of Jesus Christ. He says, “come drink this water and you will never thirst again.” Why do we choose things over Christ when He gives us an open invitation to come to Him? Jesus wants to satisfy you. Just like cigarettes, idols should have a warning label on them. They come at a cost. They make you thirsty again and they blind you from what Christ has to offer. Idols are dead, idols are mute, idols are loveless, idols hold us back from moving on. Why choose something that never loved you over someone who died to have a relationship with you? It’s not too late. Repent now and set your heart on Jesus Christ. If there is a chain that needs to be broken in your life, then look to Christ who breaks every chain. We should be like the Samaritan woman in John 4. We should be excited for what Christ has to offer. Instead of giving our attentions to what the world has to offer, let’s look to Christ and worship Him. You become like your idol. It doesn’t matter whether you believe it or not. You will become like what you worship. Those who spend their lives worshiping God are filled with the Spirit and it’s evident in their life. When you make something your idol you become consumed by it. What do you mostly talk about it? There is your idol. What do you mostly think about? There is your idol. Worship is a powerful thing. It changes your entire being. Sadly, worship is used for bad more than good. Why do you think teens are dressing immodestly? Their gods on TV are dressing immodestly. Why do you think women are seeking plastic surgeons? They want to look like their idols. The more that you are influenced by your idol the less content you become. Our idols tell us we’re not good enough the way we are. That is why many people try to look and act like their favorite celebrities. Idols don’t know your worth, but Christ thought you were to die for. It’s a horrible thing once we fall into the trap of worshiping things over God because you get deeper and deeper involved in them. This is one of the reasons that it is hard for those who are involved in voodoo to turn from their wickedness. Idol worship blinds you to the truth. For many of us idols have become a way of life and we probably have been so consumed by them that we didn’t even know that they have become idols. It doesn’t matter who you are. We all want to be loved. It should give us so much comfort to know that we are so loved by God. God doesn’t share. He wants all of you. We can’t serve two masters. We are to put God first before everything. It’s so cliché to say, “God first.” However, is it a reality in your life? Idolatry is serious to God. So much so that He tells us to flee from it and to not associate with people who call themselves believers but are idolaters. Idols separate us from God. There are many believers who are spiritually dry because they have replaced God with other things. They feel like something is missing in their life. Idols create a brokenness and a hunger in us. Jesus is the vine and when you separate from the vine you separate from the source. Is Wearing Makeup A Sin?